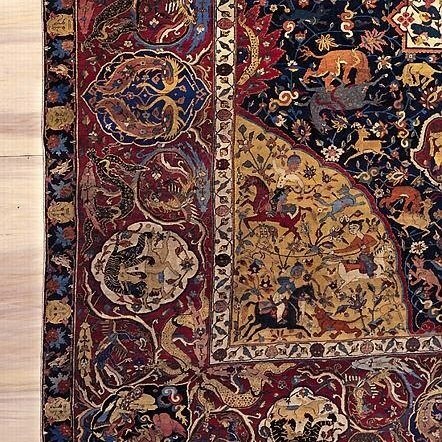 The carpets woven during the Safavid Dynasty of Iran are exquisite museum pieces that reminds us just how incredible this art form was when patronized by royalty. Although there are quite a few surviving pieces in the museums around the world, there are many others that did not survive through the eras due to many wars, fires and destructions. 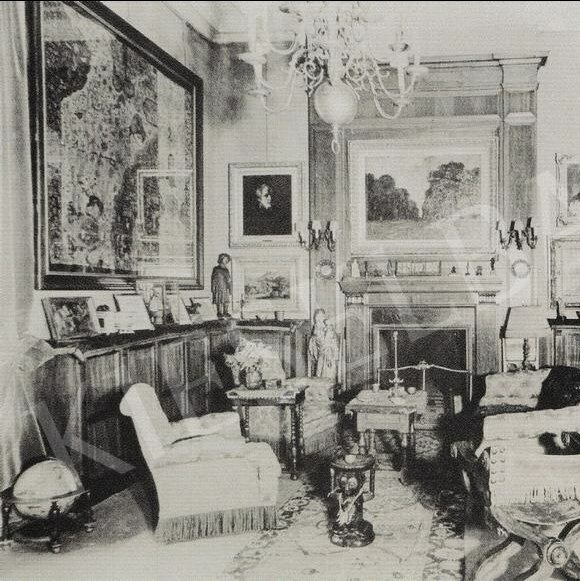 One of these pieces that I recently discovered is a fragment bought by Baron Hatvany for fifty thousand gold francs from a Polish family in Paris. He later sold the fragment to Edmund de Unger in 1944: described as a mid- 16th century Safavid fragment size:1.94x1.49 that was thankfully photographed by Arthur Upham Pope in his Survey of Persian Art, before being lost or destroyed in WW2. 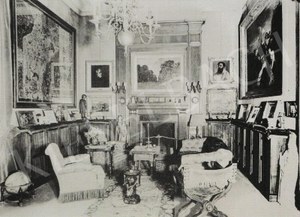 From the photograph is appears that the carpet was likely made from a miniature of the Shah Tahmasp court illustrating him entertaining a guest in the garden pavilion. 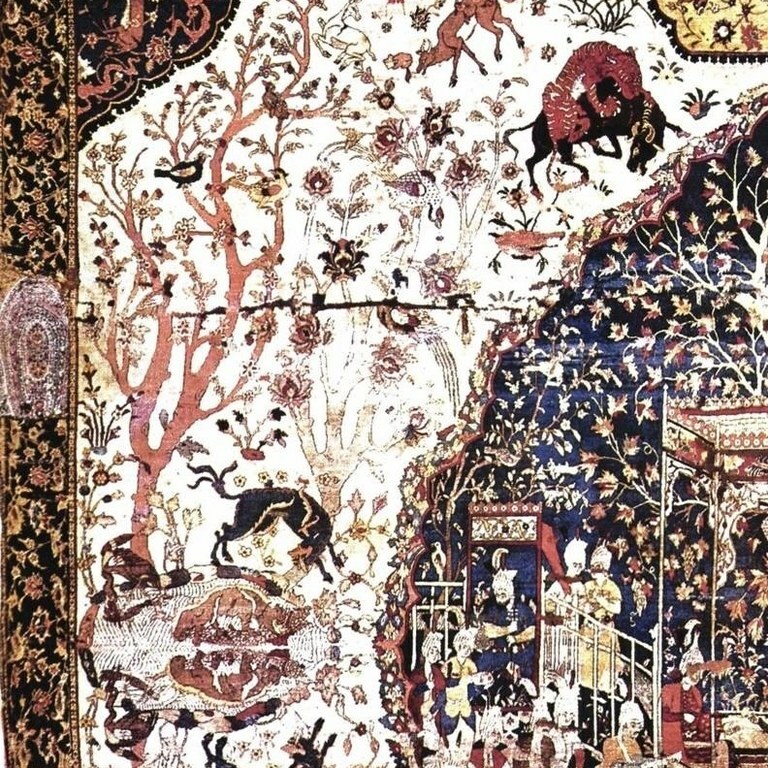 For me this fragment is the ultimate showcase of the Safavid court carpets, like the Sanguszko carpet that we wrote about before, that was taken as war booty by Prince Sanguszko from the Ottoman Emperor after the Battle of Khotin and remained in the possession of the Sanguszko family. It was first exhibited in 1904 at St. Petersburg. It was rediscovered by Arthur Upham Pope and shown again in 1931 in London, at the International Exhibition (Congress) of Persian Art, where it caused a great sensation. For the next twenty-three years, Pope had it on loan exhibition" and it became known as the Sanguszko carpet due to its provenance. 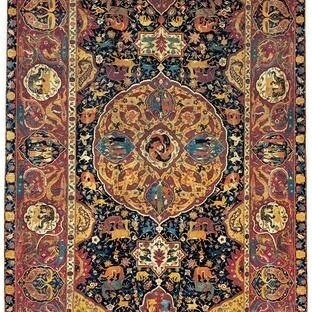 The carpet was displayed in 1949 for the visit of the Shah of Iran to Pope's Asia Institute in New York. I dare say that the Hatvany carpet was a much finer piece than the Sanguszko.